Do You Think With Your Head or Your Heart? Have you ever thought about whether you are thinking with your head or your heart? Of course you have! There have certainly been moments in all of our lives when we have stopped and pondered just which part of us was making a decision. Is thinking with one better than the other? To find the answer, we need to consider the types of decisions we’re making. In many ways, it does not matter what the decision relates to, a new love, a new jacket or a new fridge; the decision process is largely the same. Let’s take a look at dinner. What’s for dinner on a Sunday night is probably a decision of the heart. We sleep in and get up late, have a leisurely breakfast, then later on see what you feel like eating. Monday on the other hand, after a hard day’s work; is most definitely a decision of the head, with the decision often being made at the door of the freezer! Technologically, let’s say you’re buying a new laptop computer. You weigh all of the options: RAM, gigabytes, screen size, and you think about what you need it for, etc. The white one has all of the specs you need, and it is the right price. But there’s a blue one over there, and it’s lovely – and only $30 more! Hmmm, you decide. So, do you think with your head or your heart? While this makes sense on paper, it’s how we use this understanding to help us make more balanced decisions. In general, the ‘heart’ person looks at most things from an emotional standpoint. They will weigh all of the options, and they may take a little bit too long to make a decision. Is he or she my type? The ‘head’ person, on the other hand, is usually the more logical of the two. This person prefers to be autonomous and has little difficulty rationalizing many options to come to a decision. There’s a plan in place and whether or not it is in motion, many decisions are made based on this plan. That is not to say that the ‘head’ person does not value the opinions of others, they certainly do; but after all is said and done, it was always going to their decision. Remember the plan is their central focus and just because they are out dancing tonight does not mean they won’t be in class tomorrow, and they won’t blow the week’s budget on clothes. Speaking of class, the ‘head’ person also tends to do well academically and is at risk of occasionally coming across as cold; even though rational does not mean unfeeling. Head thinkers also tend to be less stressed out, and you can easily imagine the kind of careers they are drawn to. Do you identify more with Oprah Winfrey or Warren Buffet? Are you Mr. Spock or Captain Kirk? Or maybe you’re like Albert Einstein, who said, “Logic will get you from A to B; Imagination will take you everywhere.” He clearly had time for both thinkers of the head and of the heart. 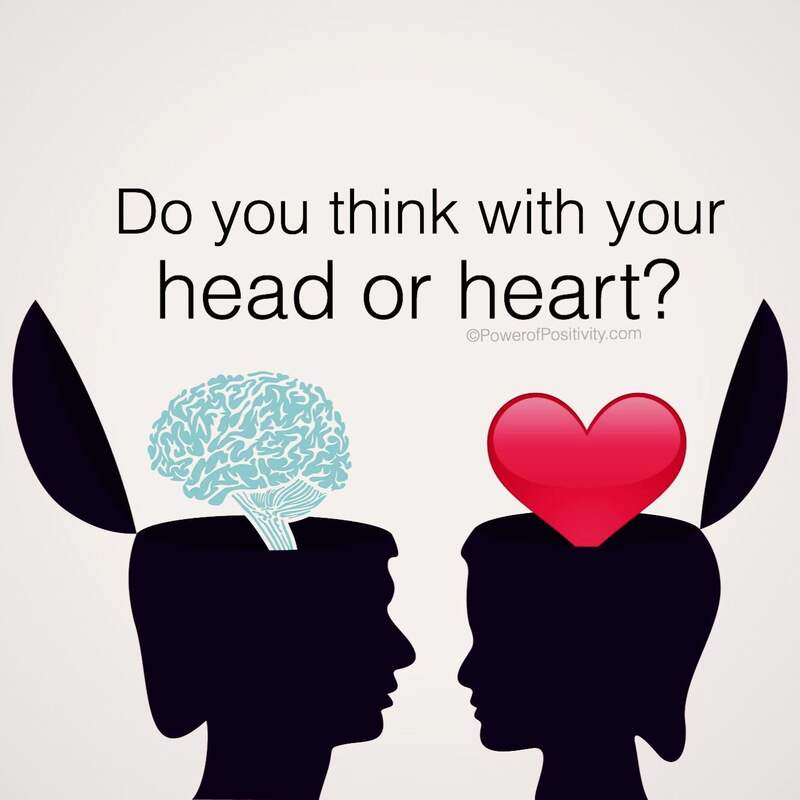 It’s probably easy to identify whether you are a head or heart thinker. The real balance comes when you listen to what both your head and your heart are telling you. On a final note, there are going to be times when you are torn and don’t know what to decide. These are times when neither your head nor your heart can help you. You ponder and pause and ponder again, examine all the angles and still can’t come to a decision, neither logically or emotionally. That’s when we ask what our gut is telling us.